U-Ta-Wa-Un – Who are you? Once again, while searching in old newspapers for something completely different, I found a nice little treasure. Actually this one was pretty big, if you count the number of words. At some point in a puzzling research project, I think most genealogists find themselves asking a dead ancestor something like “Betty, just who are you really?” We might even say it out loud if nobody is listening. Of course we don’t generally expect to get an answer, but what can it hurt to ask? At a minimum, it’s a way to vent frustration. And when we get an answer? That’s the really cool and Really Spooky part of genealogy that keeps me hooked. I other day I said out loud something to the effect of “U-ta-wa-un, you little stinker, who the heck are you?” (actually that’s cleaned up considerably for my public audience). I then decided to put him aside. Within days I stumbled on a local news piece that tells me exactly who U-Ta-Wa-Un was before he was U-Ta-Wa-Un. He was listening and he answered – Spooky stuff! Normally, I would not believe anything this man claims. He is a showman and it is his business to entertain people. However, in this case his story is confirmed by local residents who recognized him and also remembered an earlier visit. At first I could not find his family with any certainty, since I did not have quite enough puzzle pieces. Later, I found a marriage record for “Chief U-ta-wa-un” in 1904 that provides the name of his parents as Stephen & Belinda. Unfortunately, no surname is provided for any of them. Armed with the given name of both parents, I had no problem finding a Stephen & Belinda Cappell in the 1850 Census. Stephen was born about 1804 in New York and is not listed as “Indian” in this census. Belinda was born about 1814 in Vermont. Curious birth location! They are in Union, Erie Co., PA with 4 children, William born c1839 NY, George born c1844 PA, Rusia Ann born c.1845 PA, and Almina born c1848 PA. I wonder if the William in this census could be W.C.? The census ages I have for U-ta-wa-un suggest he was born about 1835±1. So the age is off a bit, but how many male given names start with W? He could be a Walter, Wallace, Wilson, Washington, or Warren. Obviously, I still don’t have quite enough pieces, but this is a pretty good fit. According to the birth locations of the children in the family, William was born in NY about 1839 and the next sibling was born in PA about 1844. It appears the whole family left Cuba about 1840, for Stephen appears in Mead, Crawford Co., PA. I can’t be certain this 1840 is correct, but the ages of people in the household matches well with the 1850 census family. In 1830, I found Stephen and his wife in Hume, Allegany Co., NY. They may be newly weds, since there are no children in the household. Now, Hume is located in Allegany County, but not within the Allegany Reservation. In fact, I found nothing to suggest this family is Native American. It is very unusual to find Native Americans listed in U.S. Census records prior to 1870. In the death notice of U-ta-wa-un, there is mention he had a son that was a doctor in Toledo Ohio. 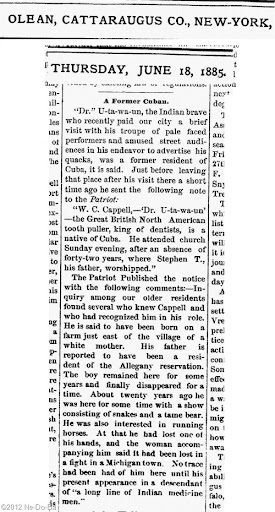 Perhaps his father is the widowed Stephen Cappell found in Toledo, Ohio in the 1870 Census. The most important item to keep in mind is that U-ta-wa-un was born in New York. Not California and not Illinois. He was a local man. It does not appear he is really Native American and he is probably not related to any of the Kanistanaux, but I still can’t rule that out with certainty. Other things I have learned about U-ta-Wa-un from historical documents. Once again, I will wrap up my research on Dr. U-ta-Wa-un, but the little voice in the back of my head says I will revisit this man again before he is through with me. Any one care to make a wager?